The GMB's amendment on "boycott Israel"
The Fire Brigade Union's case for "boycott Israel"
Jack Jones a Russian Spy? Rotten Politics, Not a Spy Story! Workers unite, east and west! Whose city is it anyway? Who are the English Defence League? Fight the public pay freeze! Gordon Brown used the opportunity of Labour Party conference to pick on a group of people who are poor, powerless and not much older than children. Did it make him feel big when he announced “from now on all 16 and 17 year old parents who get support from the taxpayer will be placed in a network of supervised homes”? Did he feel like a proper pillar of the establishment when he assured the tax paying public that “these shared homes will offer not just a roof over their heads, but a new start in life where they learn responsibility and how to raise their children properly”? John McGhee, FBU National Officer, spoke to Martin Thomas about the FBU’s “boycott Israel” motion to TUC Congress. We’re glad there was debate at the TUC about Palestinian rights. But we think that the boycott of Israeli goods which the FBU motion proposed as its main practical measure would be counterproductive. 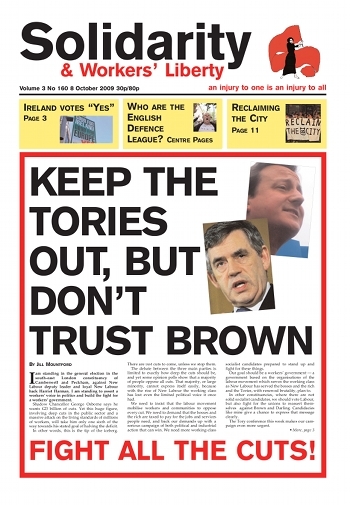 On 2 October, an internet report claimed that the Communist Party of Britain (Morning Star) had split. CPB general secretary Rob Griffiths and Morning Star editor John Haylett were reported to have quit and started forming a new organisation. This move was said to have been prompted by a decision by the CPB executive to withdraw from the talks for a “son of No2EU” slate for the general election which have been under way since June, betweeen the CPB, leaders of the rail union RMT, the Socialist Party, and the Alliance for Green Socialism. On 4 October, I attended the 70-strong Lille and district conference of the New Anticapitalist Party, the revolutionary socialist party founded in February by activists of the Ligue Communiste Révolutionnaire and many other independent socialists. According to the official history of MI5, Britain’s spy-hunters considered Jack Jones, the leader of the Transport and General Workers’ Union in the 1970s who died recently, to be a paid agent of the USSR. What secrets did he pass on to Moscow? Brace yourself for the shock: he passed on secret... Labour Party documents! In mid-1984, during the year-long miners’ strike, the Sunday Mirror printed an account of an interview with Solidarnosc leader Lech Walesa in which Walesa appeared to side with Margaret Thatcher against the miners. Socialist Organiser (forerunner of Solidarity) commented. A translation of this article appeared in the underground Trotskyist press in Poland in 1984. A few years ago, some of us were leafletting for No Sweat outside the Doc Martens’ shop in the Triangle shopping centre in Manchester, which is pictured on the front of Anna Minton’s book.